Together with the Global History Collaborative and Linking Cloth-Clothing Globally (LCCG), the Freedom of the Streets project organized the international conference “Gender, Space and City in Global History” at the University of Tokyo in the weekend of 28 and 29 October 2017. Through twelve research presentations in five panels on a wide range of topics, speakers from the US, the UK, France, Taiwan, the Netherlands and Japan investigated how a global history of gender, space and urban life can be possible. It was an interesting challenge to link and compare historical research on topics ranging from the Italian Renaissance palace to the role of landladies in Shanghai during the Republic of China. Of course, the panel themes provided guidance. The papers in the ‘consumption, space and gender’ panel (Dr. Ling-Lin Lien and Yuko Nakamura) showed us the spatial politics around saleswomen in department stores. The panel on property (Dr. Claudia Damasceno Fonseca and Dr. Sun Huei-min) showed us issues of gender and space around (non-)ownership and how space and buildings were utilized through renting and shop keeping, in places as different as early modern Brazil and modern China. The panel on everyday use of space (prof. Sandra Cavallo and Genki Takahashi) consisted of two papers on two fascinating opposites: the marginalized hinin from the Edo period and their huts and family life were followed by a paper on elite Renaissance Roman palaces. But the common theme of contrasting built environment with the social reality of these two opposites of their respective social hierarchies provided food for thought and opportunity for comparison. Furthermore, the panel on global connections (prof. Toru Miura, Dr. Khohchahar E. Chuluu and prof. Jeremy Prestholdt) brought together different approaches. It was very interesting to hear one paper on space as an issue of global mental geographies and two papers on gendered space as grounded in practices and regulations in Islamic cities, Mongolia and Japan. Finally, (although actually the first panel of the workshop) our project presented itself in a panel, where Antonia Weiss presented an outline of her new research project launch of her research on 18th century urban nature in Amsterdam and Berlin, Bob Pierik presented on the methodology and initial findings of his research on gendered use of urban space in Amsterdam, and Dr. Bébio Amaro returned to his PhD dissertation with new questions and approaches as he considered the role of gender in religious spaces in Nagasaki in the 16th and 17th centuries. In the final discussion, we debated how these different histories were connected through a host of common themes and approaches. We found that similar themes ran throughout many of the papers, such as the role of the scale of the urban environment or the difference between permissible spaces (characterized by opportunity) and suspect spaces (characterized by restriction). We discussed whether or not such themes could serve as framework for a global history. This way, a global history can be written of places that are not as explicitly linked as in other approaches to global history that focus on explicit global connections, such as the core-periphery relation between the colonizer’s metropolis and the colonial city (just to name an example). It may be interesting to consider such broad themes that come up in research on gender and urban space as metahistorical: they appear all over the world, although in different forms and locally situated contexts. This helps us go beyond grand narratives of modernity that debates of gender and urban space so often resist being fit into. They provide us with a framework for comparison that we may perhaps use as a new approach to global history. This fruitful debate had to be shortened slightly because we were reminded of the realities of urban life in Tokyo: A typhoon would soon reach the campus of the University of Tokyo. All participants could safely find their accommodations. The last day, our project had the great opportunity to meet with members of the Takeshi Ito Laboratory (Ito Lab) at the Graduate School of Engineering of the University of Tokyo for a joint study meeting. The Ito Lab is a group at the Department of Architecture headed by Prof. Takeshi Ito that focuses on Urban-Architectural history. It was very interesting to speak to a group of researchers with a different background who were working on related issues. In general, our project looks at social relations and one question is how the built environment influenced those, while the Ito Lab researchers look at the built environment, and one of their main questions is how this influenced social relations. 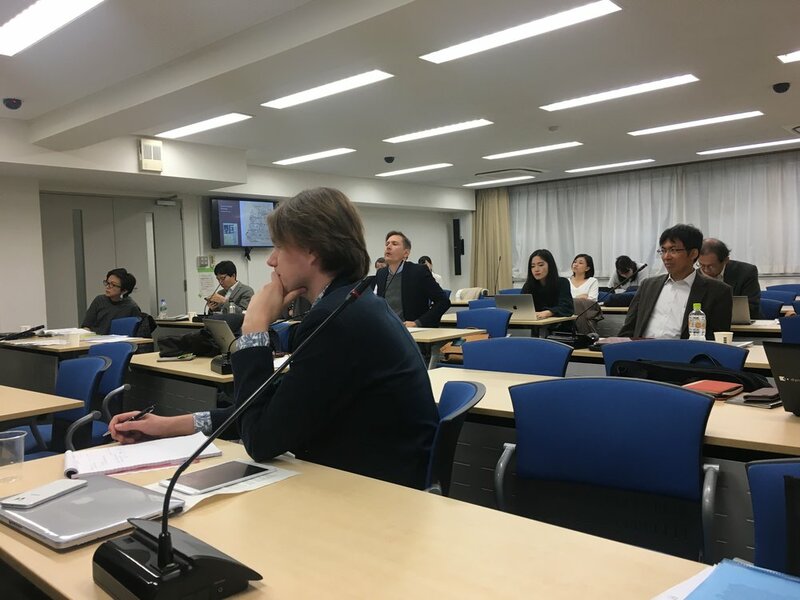 Besides being an opportunity for sharing our project to an international audience, it was our new project member Bébio Amaro’s chance to present his plans for research on Edo (early modern Tokyo) to a group that had experience with the Edo sources and could constructively think with us. Ito Lab PhD candidate Hiroki Kominami presented his research on the evolution of the Edo Temple-Parish system during the late Edo and Meiji periods. He showed how temple parishes came to determine important administrative boundaries. We had a very interesting discussion about Amsterdam and Edo and the similarities and differences of the source materials that we can use to study both. The sources are very different in terms of both the type of sources and the details that can be distilled from them. Nevertheless, we discussed ways that similar information on everyday life could be distilled from what is available to us, which will surely help our project forward in the coming months.